From all of the blessings that have happened in my life over the past few years (new house, new country, side income), is the one that has really helped me to better sleep at night, it is saving a portion I earn for future. it is the move away from living paycheck to paycheck. 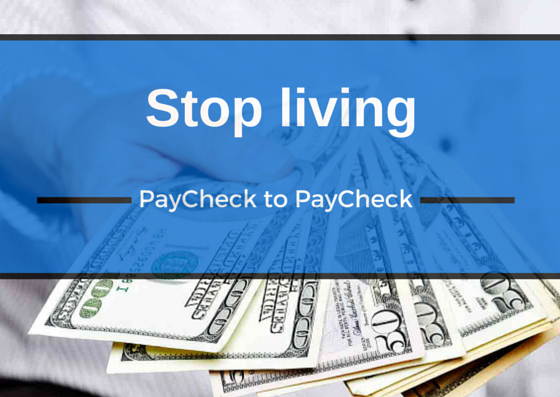 Paycheck to paycheck living happens when you’re waiting for your next paycheck before you make the financial moves basics each month, as example paying bills or buying food or doing some fun. Living pay check to paycheck is dangerous as you won’t have a surplus for rainy days. What if you lose your job? What if a disaster strikes, or, a sudden health issue arises? If you as example lost your job, your life will require you to find an alternative job quickly. Therefore, you are totally dependent on your current job. You simply can not survive even few days without your next regular paycheck coming in. So, will you be a rich person or will you choose living from paycheck to paycheck? Very important is to control your finance. Let’s go through these following simple tips to show you what are your mistakes, that don’t let you get rich, and how to avoid them. There are many ways for how to know, why your money “Disappear”. You can have special note, where you can write details, how did you spend each dollar or save checks from shops. The most important is to understand how much you spend and for what. Perhaps after that, you will find in your expenses list, many things that you didn’t need and they didn’t affect your life’s quality. Expensive food, food delivery, cafes. Stop spending money at least for this and you could collect for something you dreamed for long time. Planning budget is an important step in our right financial strategy. Write a list for your needs: payments for flat, mobile, internet, transportation, food etc. If you have any hobbies that need money or you visit courses also write this in your list. Cloths and make up tools for women, car needs for men. After this list count how much you will have after. The rest you can spend as you want or you can collect for something that you really want. If after planning budget you see that money is still not enough for your needs, you will need to cut some more expenses. Decide together with your partner, how much and for what you will spend. Sometimes it happens that man or woman consider their own needs are more important and spend more than the available budget limit. Decide this problem together before getting poor or losing this relationship. Try to explain calm and patient about situation and think together, believe me you will find the right decision. If it will be hard to find common solution, try to have separate budget and then you will both see, who was better in budget planning. Of course you can economize but never forget to think of how to make your life level higher. Try to think about investment or even another additional job for getting money. Living well is natural wish for everyone. Any stuff you have – jeans or dish, car or flat – it is money. Take care of them. Repair broken TV or tailor too long jeans. Get a master to repair in time. Even if you think, that these expenses are too high. Always remember, that to buy new will be more expensive. Do you think that shopping therapy can improve your mood? And new T-shirt and couple of shoes that you may never wear at all will change your life. No. If you really have problems in your life, then try to decide them, not just forget through shopping therapy. Spending money will never help, but only can give new problems after. There are some situations when your friends invite you to the restaurant or cinema or offer to buy together expensive presents for another friend. You can find different solutions for this. As example,try to meet at cheaper cafe, offer alternative present that will have lower cost or to say honest that is too much for your budget. It is not easy I know, but conformism in finance are more expensive. The law is – do not spend more then you can, or you will become poor faster. For the same reason do not lend money for someone who doesn’t pay this debt back. Don’t be shy to refuse. One of the most common reasons for personal debt is over use of credit cards. Do not take it as your personal line of credit. If you can’t pay off the credit card due in full by the end of the month, you should not use it for your purchases. At 15% + interest rate this may ruin your finances and possible your life. If you are too weak to handle your credit card, I’d suggest you cut them in to pieces and use cash or debit card instead. Believe me there are people around all of us who just can’t handle a credit card responsibly. Credit cards are, to me, for ease of payment and getting rewards out of my purchases. This is not a line of credit at any cost. You are dreaming of a big family vacation? How about a new motorcycle, or a new home? If you are living paycheck to paycheck, so these dreams are going to be unreachable in the near future. You might honestly need these things for your family, but they are semi-impossible with your current financial structure. Living paycheck to paycheck life is just a problem of your self imagination. But simply you are not alone in creating that problem, and you can easily get out of it completely and start now moving towards financial planning for your future. Follow the above tips wisely and you will notice the difference in your life very soon. I love all these tips! Making a budget is very important step to avoid living the paycheck to paycheck life. While budget is important, buck doesn’t stop there. One should stick to their budget consistently. Survey shows more than 60% of time people fail to keep up with budget.